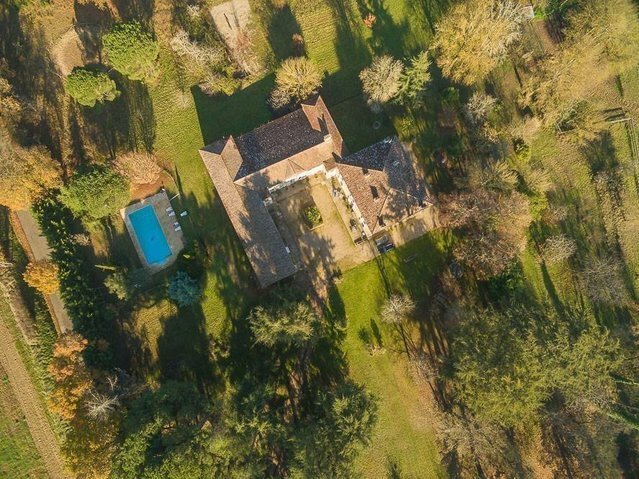 South-west of France, in the Aquitaine area, XVIIIth and XIXth century's old U shaped classic mansion property around a large courtyard, on 12 hectares of land.The building offers a living area of around 1400 sqm : large entrance hall, numerous living spaces, 10 bedrooms, etc. Several rooms are still to be converted, 2 of them are approximately 100 sqm and 132 sqm as convertible attics. A lot of charm with authentic features (old terracotta floorings, 11 fire places, beautiful cedar lined alley, stone features, etc. ).The technical equipment comprises : water softener, rain water container of 6000 litres, oil and heat pump central heating systems, generator of 20 KVA, electric gate etc...The heated swimming pool, of 13 by 6 meters, has an integrated Jacuzzi.3 horse boxes, 2 garages, workshop, wells, etc. 5 hectares of landscaped park, the remaining land is wood and meadows for horses. Easy access, not far from a town, motorway and several golf clubs.